Depending on the distance and the difficulty of the hole is established its PAR. The PAR is the number of “right”shots to put the ball in the hole. 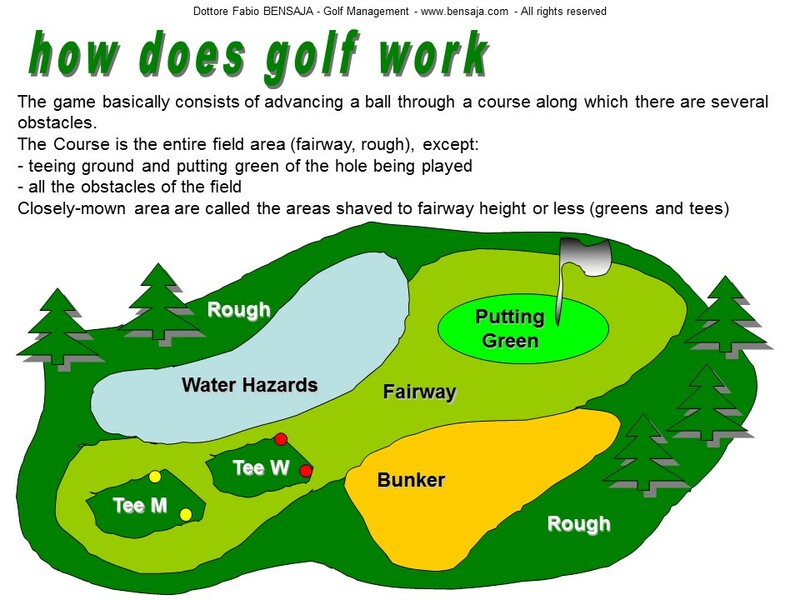 The holes can then be Par 3, Par 4 or Par 5 (to be concluded in 3, 4 or 5 shots). The PAR of the Course is the total amount of the PAR of individual holes. Here’s the score of a course PAR 72. The Handicap is the difference between the shots that I should do (then 72 in a Par 72) and the ones I do. If at the end of my round of 18 holes I usually do 108 shots, it will mean that my handicap game will be 36 (which is the difference between the 108 strokes and the PAR 72). This system allows you to play with stronger and weaker players. The handicap works as a sort of “damper” and playing using it, rewards those who, among all the players, improves himself more than others improve themselves. As seen in Tournament with NET Leaderboard high hcp players have more chances to improve their game compared to players with “low handicap”. That’s why players are divide in categories (usually 0-12 / / 13-24 / / 25-36). Medal Tournaments, so called because once it was given a medal as a prize, are characterized by the obligation of having the player to put the ball in each hole. The Stableford competition is called with the surname of its creator. Mr Stableford, in order to speed up the game, invented a system that does not need to put the ball in each hole if the player exceed a certain number of shots. In this tournament, really different than Medal tournaments, handicap strokes are not deducted at the end of the round, but on different holes are distributed according to a parameter called “stroke index” (also called “handicap the holes”) and which indicates the difficulty of the holes. The stroke index ranges from 1 to 18 and does not follow necessarily the sequence of holes, then, looking at the score below, you will find that the most difficult hole is the number 18, while the easiest is the number 7 (in the following score there is a Player with 18 strokes of handicap and, as you can see on “stroke Hcp” line, there is 1 stroke handicap in each hole). when the player makes more than 1 shot over the Par can not take any points and then he can lift the ball without waiting to putt it into the hole putting an “X” on that hole. This Fabio BENSAJA website section makes available to everyone, free of charge, the summary of the origins of the game and the most important rules of golf. All information on the rules and the history of golf are printable and can be easily viewed from smartphones and desktop PC. The illustrations are the result of a work of interpretation of the official rules of the game. For a complete reading, you should always refer to the full version of the rules of golf published by the R & A and USGA. For each country it is also important to check the provisions issued by the Federation of National Golf and Clubs that may issue the Local Rules, which may vary with official regulations. If you need clarification and explanations on the rules of golf, you can send us a request using the form available on all pages of the site. In the event that an illustration was not clear enough, ask for a new illustration and it will be published. If you like this site please do not forget to click and visit the sponsors link !! !